During February 1917, in the midst of war, the autocratic Tsarist regime in Russia was overthrown by mass demonstrations. Eight months later, in October, the working class – supported by a popular uprising in the whole country – conquered political power and began to construct a new, socialist society. The 20th century was transformed. As predicted by some, and feared by others, the World War of 1914 gave birth to revolution. The 1917 revolution was the final climax to an endemic crisis that shook Russian society during the second half of the 19th century. A great military power in Europe (but also an imposing force in Asia), it was a society trapped in economic backwardness whereas further West the capitalist mode of production triumphed. The Tsarist state had tried to use its power to bring about certain changes: agrarian reform, democratization of the administrative apparatus, modernization of the educational system, social legislation, recognition of the right to form workers’ industrial organizations “from the top”, cultural autonomy for the nationalities of the empire, etc. But each tentative reform was only partial and timid, and it was always followed by a counter-reform – all the more brutal since it was necessary to regain control of temporarily “liberated” social and political forces. “Too little and too late”: The crisis exploded in its totality for the first time in 1905. That revolution failed, but the reversal was only partial. 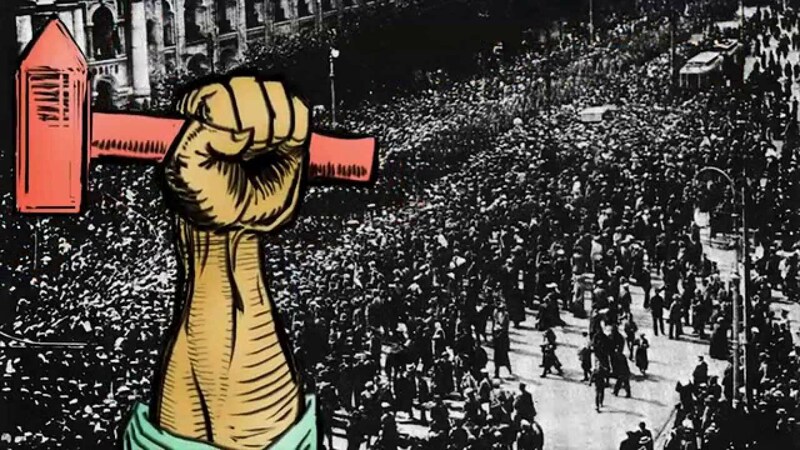 In 1914 the declaration of war put a stop to a new wave of revolutionary strikes. Three years later history took its revenge: the world conflict became a powerful catalyst for all the suffering, the frustrations, and the hopes accumulated over the years. Economic crisis: the regime was no longer able to feed its population. Political-institutional crisis: the autocratic state lost its legitimacy. Agrarian crisis: the hunger for land on the part of the peasantry was reinforced by the general difficulty of daily life. Crisis for the nationalities: they were increasingly suffocated by forced Russification. Intolerable poverty during winter of 1916-17 sparked off the revolution in February. Women – workers and housewives – lit the spark with their International Women’s Day. Starting with textile workers, the strike extended rapidly and spontaneously to the entire proletariat of Petrograd – the capital of Russia at the time. In a few days the mass strike had been transformed into an insurrection, with the military garrison coming over to the revolution. The demand for “bread” was quickly joined by demands for “immediate peace” and “down with the Tsar”. On the maelstrom of the insurrection, workers found a way to organize themselves; through the formation of soviets (councils) – in the factories, in their neighbourhoods, and in a city-wide level – as well as through a red guard (revolutionary militia). Even at the front, the soldiers elected their own committees and … their officers! Later, during the summer of 1917, the peasantry, in its turn, joined in. Thus the entire social base of the regime was eliminated. Between the end of February and the end of October 1917, Russia lived through a very specific kind of revolutionary situation: dual power. Sufficiently resolute to turn out the Tsarist regime in February, the working class was not immediately ready to take “full” power. But it covered the factories and cities with a dense network of councils which quickly expanded to include the army and, finally, the countryside. In essence a counter-power, these soviets – more and more numerous, better and better coordinated – threatened at any moment to overthrow the bourgeoisie. Two of these soviet structures played a decisive role: those which, elected on a territorial basis exercises a political power “in society” from the outset, and the factory councils, which embodied the dynamic power of the working class. These councils, resulting from the urgent needs of the masses, also reflected their level of consciousness and their political prejudices. In order for the task of taking power to become clearly posed it was necessary for a revolutionary party to put it forward, to make it a priority. The organization capable of doing this was the Bolshevik party. But that group remained a minority among the workers and in the soviets until September 1917. Thus, the history of dual power is also the history of a struggle between different political parties – representing the workers and popular movements – over this decisive question of the revolution: for or against the taking of power by the soviets. At the outset, different reformist currents (Mensheviks, Social-Revolutionaries, workerists) dominated these structures of self-organization. They led the soviets and, very quickly (by May 1917) were also taking part in the provisional (bourgeois) government. They attempted to contain the pressure of the masses through the politics of class collaboration. The evolution of the situation within the workers councils during this period of dual power is, from that time forward, tightly linked to an intensifying class struggle. At the beginning of April, 1917, the first congress of the Soviets – declared to be “pan-Russian” but in reality limited largely to St. Petersburg – had 480 delegates from the capital, 138 from local councils, and 46 from the army. It agreed to support the bourgeois-liberal government of Prince Lvov (demanding, however, to exercise control over that government!) It supported continuing the military effort; at the same time calling for an extension of the movement for workers’ councils into all countries. At the end of April, the government again tried to promote a pro-war policy, provoking large demonstrations and a strong strike movement for immediate economic demands. The pendulum was swinging to the left. At the (first) congress of factory committees in Petrograd, the Bolsheviks already had a majority because of their support for the call for “an unconditional 8-hour work day”, and “workers’ control” (by a vote of 421 to 335). Paradoxically, at the top echelons of the state and on the level of the national soviet structures, this leftward shift first translated itself – to the detriment of the liberals – by reinforcing the position of the reformists (Mensheviks, Social-Revolutionaries). Initially, they entered into a coalition government “between the classes”, which they led from that point on. At the beginning of June, the real first congress of workers and soldiers deputies met. With its 1090 elected delegates (of which 822 were properly mandated and had the right to vote) it represented some 20 million people. Elected on the basis of universal suffrage, the congress constituted the most representative and democratic body that Russia had ever known. Based on a deepgoing political pluralism, it debated, over three weeks (June 3-30), all of the vital questions facing the population. The delegates included 283 SRs (Social-Revolutionaries), 248 Mensheviks, 105 Bolsheviks, and 73 unaffiliated individuals, with the rest divided between different small socialist groups. Its executive committee, which had the character of a virtual “counter-government”, was composed of 104 Mensheviks, 100 SRs, 35 Bolsheviks, and 18 socialists from other currents. After a short time it combined forces with the Executive Committee of the All-Russian Peasant Congress, which was held separately, and where the SRs held an absolute monopoly. The coalition government, very popular at the outset, rapidly discredited itself. Similar causes bring similar results, but flavoured with an awakening class consciousness: the popular masses intervened directly one more time in the political area, with their own methods of struggle. Aware of the pressures developing at the base, the Executive Committee of the workers’ councils, under reformist leadership, tried to take over the movement by allowing a demonstration. On June 18, in Petrograd, it was nevertheless the slogans of the Bolsheviks – especially “All Power to the Soviets” (still under the leadership of the reformists) – which was by far the most popular. The new relationship of forces was tested during the “July days”. The initiative had been taken with the demonstration of June 18. The proletariat in the capital interpreted this first victory as a beginning of the final offensive. Going further than the Bolshevik party intended, the masses wanted to overthrow the government. However, this vanguard of the mass movement had failed to grasp the real situation. It was too far out in front. As a result, at the beginning of July, the pendulum swung sharply back again, quite far to the right. The bourgeoisie wanted to find a way to begin snuffing out the fire of the revolution. 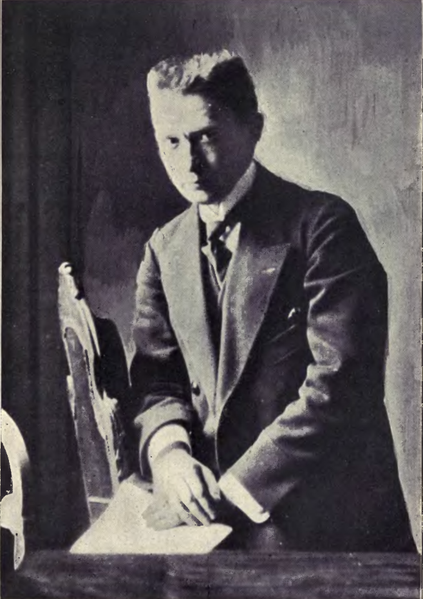 The man of the moment was named Kerensky. Alexander Kerensky was a Russian lawyer and key political figure in the Russian Revolution of 1917. Having become prime minister, Kerensky struck hard at the Bolshevik Party and the other revolutionary organizations. He tried to re-establish the cohesion of the army. He restored the death penalty, dissolved the insurgent regimes, and named General Kornilov to head the general staff. All of this was based on the “legality” of the workers councils and on their higher bodies; Kerensky was attempting to transform their subversive reality! The (reformist) Executive Committee of the Workers Councils actively collaborated with this political approach, helping to empty the soviets of their revolutionary content. They became discredited in the eyes of the vanguard workers. Kerensky thus organized a general offensive against conquests which the masses had imposed after February. In addition, he postponed indefinitely the realization of popular demands – always acknowledging them but… always postponing them for future consideration. The dual power was eroded, without totally disappearing as such. The Bolshevik Party experienced grave difficulties but maintained its majority position among the working class (as demonstrated by the municipal elections which the party won at the end of August). Some in “high places” believed that the hour for a radical counter-revolution had arrived: the military coup d’Etat. Kornilov turned his back on Kerensky and took his chances at the end of August, 1917 (similar events spring to mind: Allende and Pinochet, September 1973 in Chile; or Ebert-Noske and Kapp, Germany, 1920). In three days, the “army” with which Kerensky attacked he capital was routed. The soviets of Petrograd had taken the lead in the resistance. In this way they recaptured their place at the centre of the workers’ counter-power.